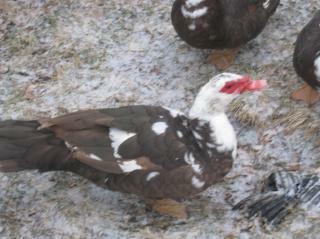 Muscovy - Male or Female? Discussion in 'Ducks' started by Country Parson, Jan 6, 2011. I'm the first to admit I take lousy pictures, especially when the sun isn't even quite up yet. 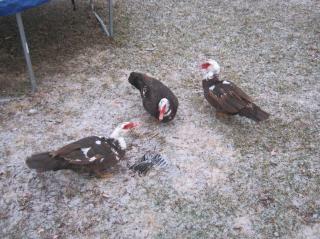 Back in June/July I got four straight-run Muscovy ducklings (one has since met his Maker). I've heard that males are considerably bigger, but mine all seem to be about the same size. Of all my various poultry, the Muscovies by far are the family favorite. We want to hatch out several more of these and make them part of our permanent backyard stock. Problem is I can't tell if these are male or female, and therefore don't know what else I need to get. I assume their all the same gender, since their about the same size. 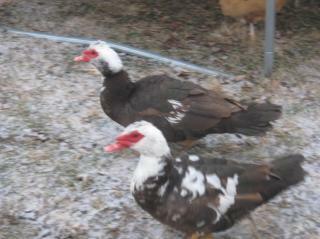 Forgive the horrible photos, but can you Muscovy-folk tell by looking at the pics? Their caruncles don't look particularly prominent so i am guessing female. Males are usually 80+cm in length when fully grown and females 60+cm. So that can be a way to tell as opposed to comparing them against each other. Hope this helps. Ps in the third picture down the duck furthest on the left looks larger than the other two in the picture so you mgiht have a mixture. I just measured 2 of them. Laid & 'stretched' out flat, they measure 21" (53cm) from the tip of the beak to the rear end, not counting the tail feathers. If I count the tail feathers the measurement is 28" (71cm) on one and 31" (78cm) on the other. So, when you say males are roughly 80cm what exactly should I be measuring (point to point)? 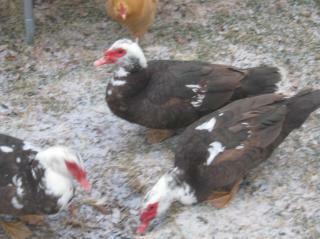 I only have one Muscovy Hen and no Drakes, but I'd say these were all Drakes based on the huskiness of their build. Their caruncles are more pronounced than my Gal's as well. I don't have muscovies, but all the other threads I have read about sexing them talk about the size of their feet! Perhaps if you could post a close up pic of their feet and legs that would be helpful to those in the know as well? IMO they look male, perhaps with one female, but more likely all males.